If you are experiencing abdominal pain during or around the time that you eat, it could be your gallbladder functioning abnormally. Symptoms include nausea every time you eat a meal (eating a high fat meal may cause worse pain), pain within just a few minutes after eating, extreme abdominal bloating after you start to eat, and a few of my patients even have reported having a runny nose while eating. If you're having some of these symptoms and you've had a workup (or many workups) and haven't been able to find a cause of the pain, we may have answers for you. Let's take a look at the anatomy of the gallbladder seen to the right. The green area is your gallbladder and it makes secretions that travel down your common bile duct and cystic duct into your bowel in order to break down fatty foods that are traveling in from your stomach. 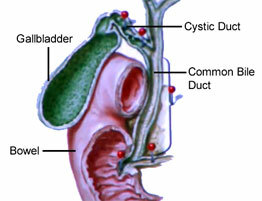 In the walls of your common bile duct and cystic bile duct are mast cells. Those mast cells release histamine which cause the ducts to swell making the opening smaller and also causing pressure to build up in the gallbladder. This pressure is what causes the pain. After you've been checked for stones and are negative, you will be asked to fast. You'll get an iv and you will be given a nuclear medicine contrast material that fills up your gallbladder. Once your gallbladder is full, they will start a simulation as if you were eating. A healthy gallbladder will start to contract, squirting out secretions to help digest. In a patient with an abnormal gallbladder, the secretions are never expelled. The gallbladder contracts repeatedly with no progress. What causes this? The walls of the ducts are swelling due to the release of histamine, causing pressure in the gallbladder. Removal of the gallbladder is done as an outpatient procedure and is the only real treatment for this condition.